Most U.S. adults identify with a particular religious denomination or group. 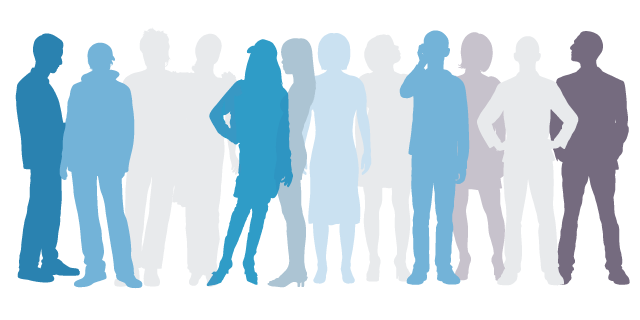 They describe themselves as Catholic, Baptist, Methodist, Jewish, Mormon or Muslim– to name just a few of the hundreds of identities or affiliations that people give in surveys. Others describe themselves as atheist, agnostic or say they have no particular religious affiliation. These are the conventional categories into which Americans sort themselves. But a new Pew Research Center analysis looks at beliefs and behaviors that cut across many denominations – important traits that unite people of different faiths, or that divide people who have the same religious affiliation – producing a new and revealing classification, or typology, of religion in America. The new typology sorts Americans into seven groups based on the religious and spiritual beliefs they share, how actively they practice their faith, the value they place on their religion, and the other sources of meaning and fulfillment in their lives. Race, ethnicity, age, education and political opinions were not among the characteristics used to create the groups. Yet some of the groups have strong partisan leanings or distinctive demographic profiles, illuminating the intrinsic connections between religion, race and politics in America. Sunday Stalwarts are the most religious group. Not only do they actively practice their faith, but they also are deeply involved in their religious congregations. God-and-Country Believers are less active in church groups or other religious organizations, but, like Sunday Stalwarts, they hold many traditional religious beliefs and tilt right on social and political issues. They are the most likely of any group to see immigrants as a threat. Racial and ethnic minorities make up a relatively large share of the Diversely Devout, who are diverse not only demographically, but also in their beliefs. It is the only group in which solid majorities say they believe in God “as described in the Bible” as well as in psychics, reincarnation and spiritual energy located in physical things. The names of the typology groups try to convey distinguishing characteristics in just a few words. Of course, no name this brief can perfectly describe a group, and some license was taken in choosing them. For example, “Sunday Stalwarts” includes some highly religious people (such as Jews, Muslims and Seventh-day Adventists) who do not observe the Sabbath on Sunday. However, nine-in-ten respondents who fall into this group identify with Christian churches that generally hold services on Sunday. Similarly, the broader group categories – highly religious, somewhat religious and nonreligious – are meant to convey general characteristics about the subgroups they comprise. For example, while God-and-Country Believers and the Diversely Devout are less likely than Sunday Stalwarts to participate in weekly worship, they are all categorized as highly religious due to similar beliefs, prayer habits, and ways they view and interact with God, among other factors. At the opposite end of the spectrum, the Solidly Secular are the least religious of the seven groups. These relatively affluent, highly educated U.S. adults – mostly white and male – tend to describe themselves as neither religious nor spiritual and to reject all New Age beliefs as well as belief in the God of the Bible.1 In fact, many do not believe in a higher power at all. Religion Resisters, on the other hand, largely do believe in some higher power or spiritual force (but not the God of the Bible), and many have some New Age beliefs and consider themselves spiritual but not religious. At the same time, members of this group express strongly negative views of organized religion, saying that churches have too much influence in politics and that, overall, religion does more harm than good. Both of these nonreligious typology groups are generally liberal and Democratic in their political views. The middle two groups straddle the border between the highly religious and the nonreligious. Seven-in-ten Relaxed Religious Americans say they believe in the God of the Bible, and four-in-ten pray daily. But relatively few attend religious services or read scripture, and they almost unanimously say it is not necessary to believe in God to be a moral person. All Spiritually Awake Americans hold at least some New Age beliefs (views rejected by most of the Relaxed Religious) and believe in God or some higher power, though many do not believe in the biblical God and relatively few attend religious services on a weekly basis. Although traditional religious affiliation categories were not used as a determining factor in making the typology groups, it is nonetheless illuminating to look at each group’s religious composition. 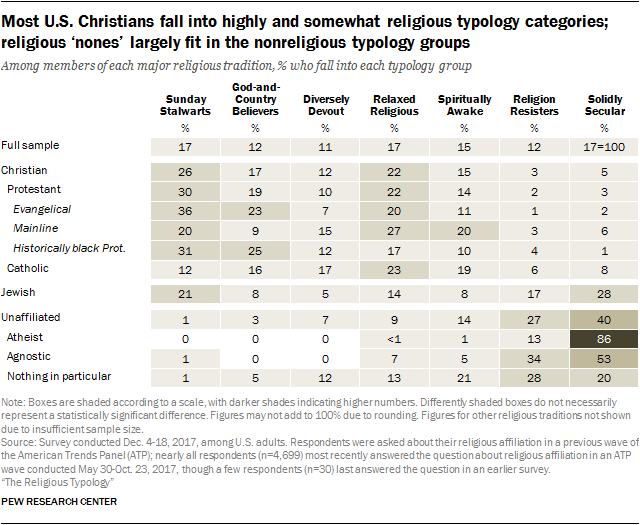 While there are clear patterns across the groups, no typology group is uniform in its religious affiliation. This shows that members of widely disparate religious traditions sometimes have a lot in common: Sunday Stalwarts, for instance, are largely Protestant, but also include Catholics, Mormons, Jehovah’s Witnesses, Jews, Muslims, Hindus and others. Among the highly religious typology groups, the religious identity profiles of Sunday Stalwarts and God-and-Country Believers are very similar. Majorities in each group are Protestant, and evangelical Protestantism constitutes the single largest religious tradition in both groups. Compared with Sunday Stalwarts, God-and-Country Believers include more Catholics (24% vs. 13%) and religiously unaffiliated Americans (8% vs. 1%), and somewhat fewer Mormons (less than 1% vs. 5%). 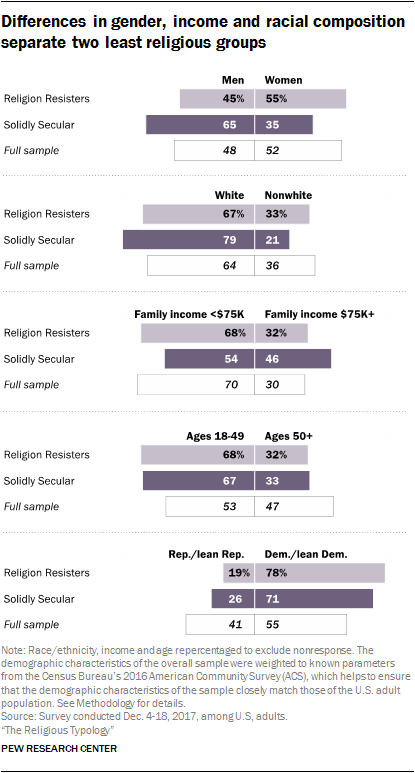 A majority of the Solidly Secular (76%) and Religion Resisters (71%) are unaffiliated, including one-in-five in each group who describe themselves as agnostic. Religion Resisters are more likely than the Solidly Secular to describe their religion as “nothing in particular” (45% vs. 23%), while the Solidly Secular are more likely than Religion Resisters to describe themselves as atheists (31% vs. 6%). Like the highly religious groups, the somewhat religious groups are mostly composed of Christians. There are more evangelicals among the Relaxed Religious than among the Spiritually Awake (25% vs. 16%), and more religious “nones” among the Spiritually Awake than among the Relaxed Religious (30% vs. 17%). A section at the end of this overview analyzes these groups from the opposite direction, looking at the share of each religious tradition belonging to each typology group (e.g., the share of U.S. Jews who are Sunday Stalwarts, God-and-Country Believers, etc.). Outside of the Sunday Stalwarts, relatively few Americans – even those who otherwise hold strong religious beliefs – frequently attend religious services or read scripture. About eight-in-ten Sunday Stalwarts attend religious services at least once a week – three times greater than the share of frequent attenders among God-and-Country Believers, and roughly seven times larger than the proportion of the Diversely Devout who are as observant. A similar pattern exists among the groups in the share who regularly read the Bible or other holy scriptures. The Solidly Secular are the only group that includes sizable numbers who say they do not believe in God or any kind of higher power. Even among the Religion Resisters, who generally view religious institutions with great skepticism, the vast majority believe in some higher power or spiritual force (though not necessarily in the biblical depiction of God). By contrast, across all five groups that are either highly religious or somewhat religious, there is broad agreement that God exists and has characteristics such as being all-loving, all-knowing and all-powerful. Large majorities in these five groups also say they talk to God. 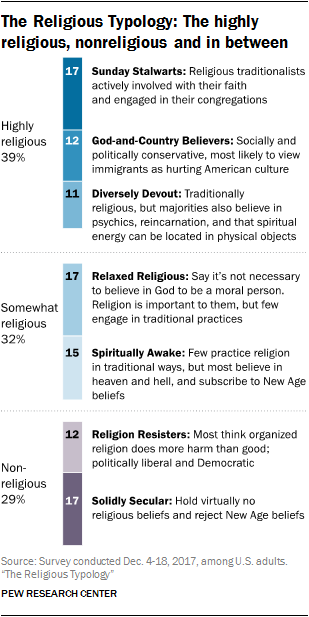 New Age beliefs are common, even among Americans who are highly religious in traditional ways. For example, about three-in-ten Sunday Stalwarts believe in psychics, and a similar share say that spiritual energy can be located in physical objects such as mountains, trees and crystals. Smaller shares believe in reincarnation and astrology. Overall, half of Sunday Stalwarts and God-and-Country Believers and nearly all of the Diversely Devout affirm at least one of these four New Age beliefs. One of these items was among the characteristics used to create the groups, and it helps define the boundaries of the two somewhat religious typology groups, as well as the two nonreligious groups: Nearly all of the Spiritually Awake and Religion Resisters believe there is spiritual energy in physical objects, while virtually none of the Relaxed Religious or the Solidly Secular do. Americans draw meaning and fulfillment from many different sources – not only from their families, friends and careers, but also from being in the great outdoors, taking care of pets, listening to music and reading. Still, about two-thirds of Sunday Stalwarts say their religious faith is the single most important source of meaning in their lives. 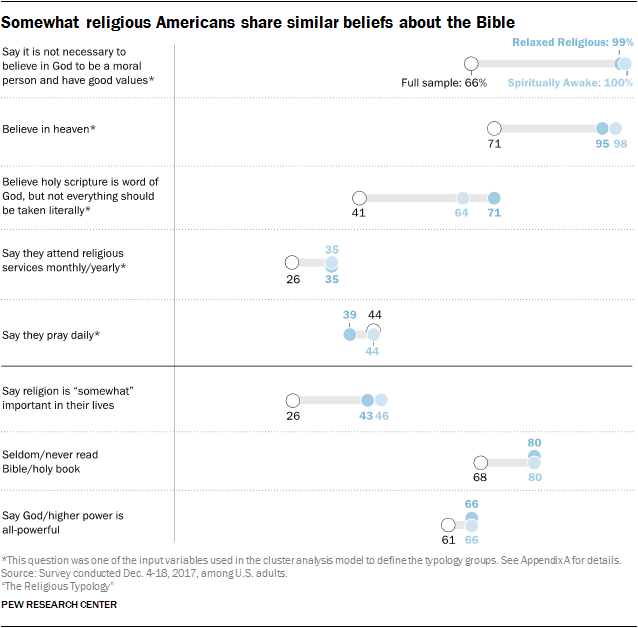 While roughly half or more in the two other highly religious groups also say they draw a great deal of meaning from their faith, far fewer say it is the most important source. Family time ranks as the top source of meaning in life for most of the groups. Can you be moral without believing in God? For more than 2,000 years, that question has sparked an energetic debate among religious thinkers.2 And just as the question has divided scholars and philosophers, it is a key determinant of the seven typology groups, marking the border separating the highly religious from the other groups. For the three highly religious groups (Sunday Stalwarts, God-and-Country Believers and the Diversely Devout), the answer is clear: Belief in God is a prerequisite for being a good person. By contrast, overwhelming majorities in the somewhat religious and nonreligious groups are united in the opposite view: It is not necessary for a person to believe in God to be moral and have good values. Why a religious typology? And how were the groups defined? The typology groups were created using cluster analysis, a statistical technique that identified homogeneous groups of respondents based on their answers to 16 questions about their religious and spiritual beliefs and practices, the value they place on their religion, and the other sources of meaning and fulfillment in their lives. In some ways, cluster analysis is as much art as science. The groups that emerge will depend on both the number of groups that researchers specify and the questions that they choose to include in the analysis. What’s more, there is no “correct” cluster solution or any single criteria for deciding which solution is best. Researchers must weigh a number of factors: whether it’s clear why people are grouped together, whether the groups are different enough from each other to be analytically useful, and whether the groups are consistent with what researchers already know about the subject. In preparing this report, researchers tested several possible solutions – ranging from five to eight groups – and experimented with including larger and smaller numbers of questions. Researchers ultimately settled on the 16-question, seven-category cluster solution summarized in this report because it has several strengths. First, the solution divides respondents into a relatively small number of groups that are distinct from one another, large enough to permit statistical analysis, and substantively meaningful. Second, all the survey questions that went into the algorithm are measures of religious or spiritual characteristics, making this truly a religious typology. 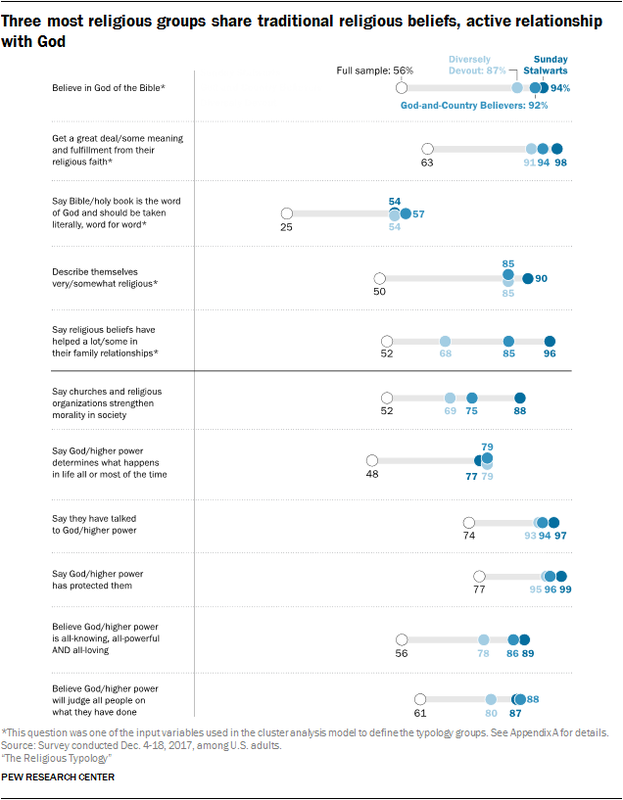 Pew Research Center’s religious typology is not meant to replace conventional religious affiliations, but rather to offer a new and complementary lens with which to glean new insights into religion and public life in the U.S. In most surveys about religion, including those conducted by Pew Research Center, researchers analyze the data by dividing the respondents into commonly understood categories, such as Catholics, Jews and Muslims. Specifically, 16 questions from the survey covering a variety of religious and spiritual domains were combined in a statistical model to define the seven typology groups (see table below for a list of the questions). The model did not include any demographic questions or Pew Research Center’s standard question about religious affiliation, meaning that the religious tradition – or lack thereof – with which respondents identify did not affect their placement in a typology group. Though only 16 questions were used to create the groups, many additional questions were asked of the survey respondents and are included in this report. The survey was conducted online Dec. 4 to 18, 2017, among 4,729 members of the Pew Research Center’s American Trends Panel, a nationally representative panel of randomly selected U.S. adults (18 and older) recruited from landline and cellphone random-digit-dial surveys. See Methodology for more details. The typology identifies three distinctive groups of highly religious Americans, united by a traditional view of God “as described in the Bible,” and by the shared conviction that organized religion is generally a force for good in American life. Nine-in-ten or more among Sunday Stalwarts, God-and-Country Believers and Diversely Devout say religion is important in their lives, and overwhelming majorities in these groups describe themselves as religious people. These religious Americans worship a God that they describe as all-powerful, all-knowing and all-loving. Rather than a distant presence or abstract entity, they see God as an active force in their lives. The vast majority say they have talked to God and that God has protected or rewarded them, while roughly eight-in-ten in each group say God determines all or most of what happens in their lives. Large majorities agree that God will judge all people on what they have done. On a practical level, members of these three groups find their religion to be a source of comfort and clarity in their day-to-day lives. Most say they rely on their religious beliefs to cope with life’s difficulties and to help them do what is right, even when it’s hard. Their religious faith also helps them in their family and social relationships, and majorities in each group say religion helps them in their job or career. And in an increasingly polarized country, most respondents in these three groups say churches and other religious organizations bring people together and strengthen morality in society. Despite these commonly held beliefs, these three groups differ from one another in some ways, including how engaged they are with their congregations and communities, the degree to which they hold religion to be central to their lives, and their acceptance of New Age beliefs. For instance, the clustering algorithm clearly differentiates the Sunday Stalwarts from other highly religious groups because of their involvement in their congregations. Indeed, virtually all Sunday Stalwarts say they are active in church groups or other religious organizations. And fully eight-in-ten say they attend religious services on a weekly basis. In addition, four-in-ten say they read the Bible or their religion’s sacred text at least once a day, roughly three times the rate of either of the other two highly religious groups. And about two-thirds of all Sunday Stalwarts say religion is the single most important source of meaning in their life; no more than four-in-ten members of any other group value their faith so highly. Sunday Stalwarts also pray more often and are more likely to describe themselves as very spiritual and very religious. Their involvement with others extends beyond their congregations to their local communities. Sunday Stalwarts are twice as likely as any other group to say they are active in a charitable or volunteer organization and are similarly more engaged in youth organizations (such as the PTA or Scouts), book clubs or study groups. And they are the most likely of any group to say they “always” vote in local elections. In a different way, politics and policy also separate God-and-Country Believers from all other groups. They are the only group that leans more toward approval than disapproval of Donald Trump’s performance as president. And fully two-thirds say immigrants are a threat to American values and customs, the largest share of any group. God-and-Country Believers and Sunday Stalwarts are the only groups in which majorities identify as Republican (59% for both groups) and about half describe themselves as politically conservative (55% and 53%, respectively). But in other ways related to their religious practices and beliefs, the predominantly middle-aged and female God-and-Country Believers more closely resemble the Diversely Devout than they do Sunday Stalwarts. 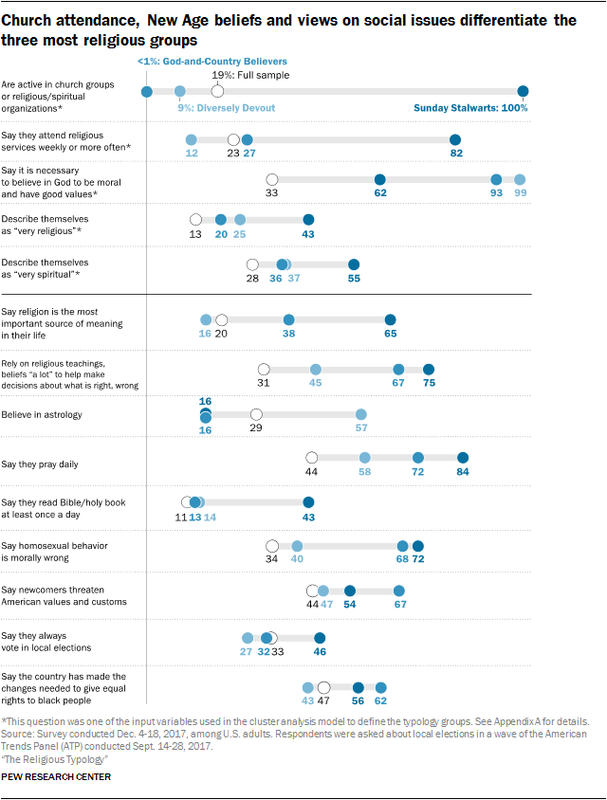 God-and-Country Believers (20%) and the Diversely Devout (25%) are much less likely than Sunday Stalwarts (43%) to describe themselves as “very religious” (though about six-in-ten in both groups say they are “somewhat” religious). 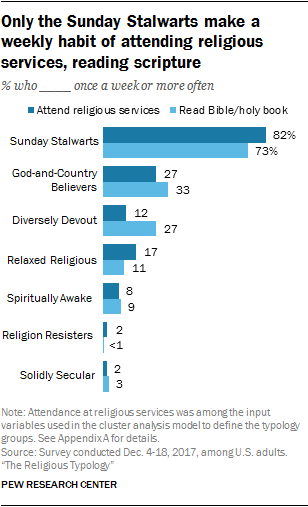 Similarly, about one-in-seven in each group say they read the Bible at least once a day (vs. 43% of Sunday Stalwarts). And both God-and-Country Believers and the Diversely Devout are defined in part by their absolutism on the question of God and morality, with nine-in-ten or more saying it is necessary to believe in God to live a moral life and have good values. Fewer Sunday Stalwarts (62%) take this position. On many measures of religious practice and belief, God-and-Country Believers fall squarely between the two other highly religious groups. About four-in-ten say religion is the single most important source of meaning in their lives, well below Sunday Stalwarts but above the Diversely Devout. And 72% say they pray daily; by contrast, 84% of all Sunday Stalwarts and 58% of the Diversely Devout say they pray as often. Their New Age beliefs and their demographic profile set the Diversely Devout apart from other highly religious Americans. 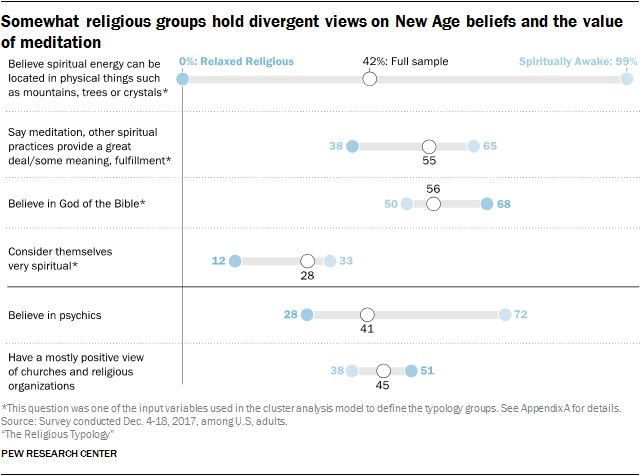 While substantial majorities value religion and consider themselves to be religious, they are the only highly religious group in which majorities also embrace a variety of New Age beliefs. They are about twice as likely to believe in psychics as either the Sunday Stalwarts or God-and-Country Believers (68% vs. 32% and 28%, respectively) and three times more likely to believe in astrology or reincarnation. And the belief that spiritual energy can be located in physical objects like mountains, trees or crystals was included in the cluster model and is one of the defining characteristics of this group – 95% of the Diversely Devout say they believe this, compared with 29% of Sunday Stalwarts and none of the God-and-Country Believers. Politically, the Diversely Devout are the most likely of the highly religious groups to identify as Democrats (49%) and the least likely to say they are politically conservative (39%). They also are the least likely to be registered to vote. And they tend to be more liberal than other highly religious Americans on social issues. They are less likely than Sunday Stalwarts or God-and-Country Believers to say homosexual behavior is morally wrong or that the country has made enough changes to give black people equal rights with whites. Demographic differences also set the Diversely Devout apart from other religious Americans. While 43% are white, nearly half are Hispanic or black, and about one-in-ten come from another racial or ethnic background, making it the only religious typology group without a white majority. Making ends meet is a struggle for many of the Diversely Devout. Most people in this group have household incomes of less than $30,000 – the highest share of any group – and half are at least somewhat dissatisfied with their current financial situation. About four-in-ten live in a household that received food stamp benefits in the previous year, double the proportion in the next-highest group. At the opposite end of the spectrum from the three highly religious groups are the Religion Resisters and the Solidly Secular. Overwhelming majorities of these groups seldom or never attend religious services, rarely (if ever) pray, and reject belief in the God of the Bible – instead believing in another higher power or spiritual force, or in no higher power at all. Most do not identify with a religious denomination, and nearly all say it is not necessary to believe in God to be a moral person and have good values. In terms of politics, too, these groups are the polar opposite of Sunday Stalwarts and God-and-Country Believers: Both Religion Resisters and the Solidly Secular are overwhelmingly Democratic. They are the most likely of any of the groups to describe themselves as political liberals and the least likely to say they are conservative. These political leanings are reflected in their policy preferences. Large majorities of both groups believe humans are the main cause of global warming and that immigrants strengthen American society. Overwhelming shares disapprove of the job that Donald Trump is doing as president. And relatively few in either group have a moral objection to abortion or homosexual behavior. Demographically, they are somewhat younger and more highly educated than most other groups; 45% of the Solidly Secular and 40% of Religion Resisters have college degrees. At the same time, Religion Resisters and the Solidly Secular exhibit stark differences from one another in the extent to which they embrace spiritual and New Age beliefs. They also diverge over the role organized religious institutions and churches play in society. And they look different in some ways demographically, including their gender makeup and household income. By a substantial margin, Solidly Seculars are the least religious and spiritual of the seven groups. About three-quarters say they are neither religious nor spiritual, more than double the next-largest proportion in any other group. They are the least likely of any of the groups to say that spiritual practices such as meditation give meaning and fulfillment to their lives. And this broad rejection of the religious and spiritual extends to the supernatural: They are the least likely of any of the groups to say they hold New Age beliefs. So what do Solidly Seculars believe? When it comes to God, the answer for about half is “nothing.” Not only do roughly half identify as atheist (31%) or agnostic (22%), but a similar share (52%) say they do not believe in God or a higher power or spiritual force of any kind. To underscore how different Solidly Seculars are from the rest of the public in this regard, the next-largest share of any other group that rejects belief in God or a higher power is 7%, among Religion Resisters. Indeed, most Religion Resisters believe in a higher power or spiritual force – albeit one that does not resemble the God of the Bible (87%). And one of the defining characteristics of the Religion Resisters is that they almost unanimously (98%) say spiritual energy can be located in physical objects; hardly any of the Solidly Secular believe this. In addition, about six-in-ten Religion Resisters (62%) believe in psychics, and half believe in reincarnation. Fully two-thirds describe themselves as “spiritual but not religious,” a much larger proportion than in any other group. Not only do most Religion Resisters eschew religion as a part of their identity, but about two-thirds say churches and religious organizations do more harm than good in society (64%). By contrast, fewer than half of Solidly Seculars and no more than 16% of the five more-religious groups say the same. In addition, about six-in-ten Religion Resisters (58%) say religious institutions “push people apart,” and fully eight-in-ten (82%) believe churches are too influential in politics. Politically, this group is heavily Democratic and liberal on several issues; for example, fully seven-in-ten say the country has not gone far enough to give women equal rights with men. It contains the largest share of those who disapprove of the way President Donald Trump is handing his job as president (84%). And even though they find fault with the current president, about three-quarters say they want the government to do more to solve the country’s problems. Religion Resisters are more likely than Solidly Seculars to derive personal meaning from a number of sources. For example, nearly two-thirds say that being outdoors in nature provides them with a great deal of meaning and fulfillment, a view shared by fewer than half of Solidly Seculars. Spending time with family, listening to music, caring for pets and reading are among the other areas where Religion Resisters find more meaning. Demographically, Solidly Seculars stand out from every other typology group in several ways. They are the most affluent of the seven groups – 46% have household incomes of $75,000 or more – and the only group in which a clear majority is male (65%). Non-Hispanic whites dominate: Nearly eight-in-ten Solidly Seculars are white, the largest proportion of any group, while only 2% are black, the smallest share of the groups. While they express some religious and spiritual beliefs, very few of the Relaxed Religious or the Spiritually Awake consider religion the most important thing in their lives. On a number of key measures of belief and practice, these two groups more closely resemble each other than they do any of the three highly religious or two nonreligious groups. For example, about four-in-ten Relaxed Religious and Spiritually Awake Americans pray daily, at least three times as many as those in the two nonreligious groups, but significantly fewer than the three highly religious groups. Roughly a third in both groups (35% each) say they attend religious services on a monthly or yearly basis (but not more often or less often). And pluralities among both the Relaxed Religious and the Spiritually Awake say religion is “somewhat” important to them (43% and 46%, respectively), while a quarter or fewer say it is “very” important. In some ways, these two groups also have similar views about God and spirituality: Nearly all believe in heaven, identical shares in each group say God or another higher power is all-knowing (85% each) and all-powerful (66% each), and overwhelming majorities say they talk to God or another higher power. Neither group, however, views belief in God as a prerequisite for being a good person; in fact, one of the clustering algorithm’s defining characteristics for these groups is that nearly universal shares in each say it is not necessary to believe in God to be moral and have good values, in sharp contrast with the highly religious typology groups. These also are the only groups in which majorities believe that the Bible (or other holy scripture) is the word of God but should not be taken literally. By contrast, the highly religious groups tend to see the Bible or other scripture as the literal word of God, while the nonreligious groups largely say the Bible was written by people. In addition, relatively few members of either the Relaxed Religious or the Spiritually Awake say they read the Bible with any regularity. But in other ways, the Relaxed Religious and the Spiritually Awake have different views about God. While virtually all people in both groups express belief in God or a higher power, most Relaxed Religious believe in God as described in the Bible (68%), while the Spiritually Awake are divided between those who believe in a biblical God (50%) and those who envision some other higher power or spiritual force (49%). Belief in New Age concepts even more sharply distinguishes the two somewhat religious groups. From astrology to reincarnation to belief in psychics, New Age beliefs are embraced by substantial majorities of the Spiritually Awake, but rejected by most Relaxed Religious Americans. Nearly all of the Spiritually Awake (99%) believe that spiritual energy can be located in physical objects, a belief shared by no one in the Relaxed Religious group – again reflecting the key role of this question in creating the cluster groups. Similarly, about two-thirds of the Spiritually Awake say that spiritual practices like meditation add “a great deal” or “some” meaning and fulfillment to their lives; fewer (roughly four-in-ten) Relaxed Religious Americans agree. Spiritually Awake Americans also are nearly three times more likely than those in the Relaxed Religious group to describe themselves as “very spiritual” (33% vs. 12%). While the Spiritually Awake have more of an affinity for New Age beliefs, the Relaxed Religious are somewhat more positive in their attitudes toward organized religious institutions. For instance, about half of the Relaxed Religious (51%) say they have mostly positive views of churches and other religious organizations, compared with 38% of the Spiritually Awake. The Relaxed Religious also are more likely to say churches strengthen morality in society and bring people together, and less likely to say religious institutions have too much influence in politics. Compared with the Spiritually Awake, the Relaxed Religious are more likely to be men and Republicans. In other ways, both the Relaxed Religious and Spiritually Awake closely mirror each other and U.S. adults overall in terms of their demographics, including their racial and ethnic composition, age and household income. While this overview previously looked at the shares of each typology group that fall into each major religious tradition, this section flips the lens, instead reporting the percentage of members of each religious tradition who fall into a particular typology group. For example, fully nine-in-ten U.S. Christians fall into one of the five highly religious or somewhat religious groups, with 55% in the three most religious groups – the Sunday Stalwarts, God-and-Country Believers and Diversely Devout. No single typology group constitutes a majority of any Christian tradition. Evangelical Protestants are more likely to fall into the Sunday Stalwarts category (36%) than into any other typology group. Mainline Protestants, Catholics and members of the historically black Protestant tradition, meanwhile, are even more spread across several religious typology groups, showing a range of religious beliefs and behaviors within these traditions. For example, no more than a quarter of Catholics are in any single typology group. Most religiously unaffiliated Americans – a group that includes those who identify as atheist, agnostic or “nothing in particular” – are either Solidly Secular (40%) or Religion Resisters (27%). Self-identified atheists are overwhelmingly Solidly Seculars (86%), as are about half of agnostics (53%). The composition of those who say their religion is “nothing in particular” is more mixed, with considerable percentages falling into the Religion Resisters (28%), Spiritually Awake (21%) and Solidly Secular (20%) categories. The remainder of this report compares and contrasts the seven groups in more detail. The first chapter examines their religious participation and beliefs, including beliefs about God. The second chapter describes each group’s views of churches and religious organizations, while Chapter 3 identifies where each group finds meaning and fulfillment in their lives. Chapter 4 highlights their political and policy differences and similarities, and Chapter 5 presents a demographic profile of the seven typology groups.